Communist-led government should be successful, says Nepal - Integration Through Media ....! BHAKTAPUR: Former Prime Minister and senior leader of the Communist Party of Nepal, Madhav Kumar Nepal, has said that communist movement has become successful in the country. 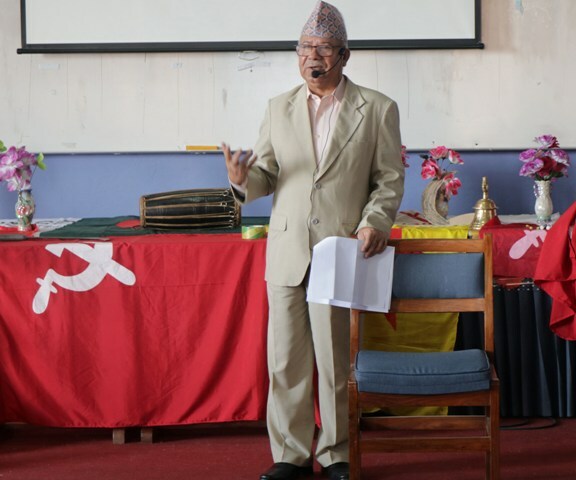 At a training ‘History of the World Communist Movement and Present Situation’ being organised by Madan Bhandari Asian School, the school established as the first communist school of Nepal, at Kharipati, Bhaktapur, leader Nepal said the communist-led government should be successful. Saying the country has moved ahead towards prosperity and development due to communist-led government, the CPN leader stressed that the relation of the communist-led government and people should be very close. He further said that special activities should be carried out in education, irrigation, roads, sanitation and health sectors. Leader Nepal said there was necessary of social, economic and cultural revolution in the country as political revolution has been completed in the country as such responsibility has come upon the shoulder of CPN. He also pointed out the need of making rule and process of the unification up to lower-level systematic to make unification between the two big communist parties long-lasting. The 21-day training launched from August 25 would conclude on September 14. Prime Minister had inaugurated the training where 49 people from 14 countries including Nepal, India, Bangladesh, Sri Lanka, Pakistan, Thailand, Argentina and Brazil are participating. The participants are being taught about Marxism, Leninism and Communism. Prime Minster Oli, former Prime Minister Madhav Kumar Oli, Narayankaji Shrestha, Modnath Prashrit, Bamdev Gautam, Bishnu Poudel, Beduram Bhusal as well as communism experts of different countries including Parbirpur Kayastha of India and Shusantwa Das of Bangladesh imparted training.